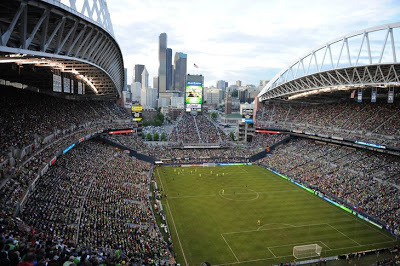 Last Sunday, CenturyLink Field in Seattle had 66,452 screaming fans. If your first reaction was wondering who the Seahawks were playing, you would probably be surprised to find out that it was not an NFL game at all. It was a Major League Soccer match. And if that wasn't interesting enough, it was not a playoff game, and there were no special promotions or double-headers with international teams. Sunday in Seattle was just plain MLS soccer. And the city, along with many others in the country, is falling more and more in love with it. Last year at Gillette, 51,523 fans came to see the Revolution play an exhibition match against Manchester United. Of course this was not an MLS match, but it is still encouraging since it was played on a tough drawing Wednesday night. Although the Revolution's average home attendance this season was 13,281 (and 13,222 in 2011), poor on-field play and the lack of a soccer-specific stadium has long hurt the Revs. With the demand other MLS markets are seeing across the country, such as Seattle, Portland and Kansas City, the rise in popularity of the MLS will soon come to New England. The Boston area, along with the rest of New England, has an enormous amount of youth soccer programs. With MLS thriving, these youth are more and more likely to grow up fans of their MLS team, and continue to support the team as they grow older. This is where the MLS has an advantage over the NHL, NBA and MLB, where popularity is more steady, and not exactly increasing much. Even though this is the same old story soccer fans have been preaching since the 1970's during the days of the North American Soccer League, along with Pele and the New York Cosmos, this time soccer actually has a stable league in MLS that has learned from the mistakes of the old NASL. The Revolution will ride the success of teams like the Seattle Sounders, and will capitalize off the success of MLS as the league grows, into growth of its own. They have solid ownership in the Kraft Sports Group, and a market that embraces soccer. When the on-field performance improves, so will the response off the field. It is only a matter of time before the revolution in MLS comes to New England.